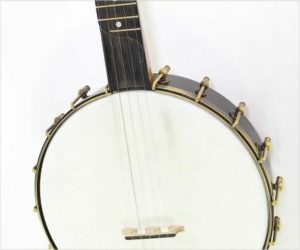 The Rickard Maple Ridge Frailing Banjo is an open back, frailing style instrument built in Aurora, Ontario by Bill Rickard who also crafts the metal components. This lovely, very well made banjo features a three-piece laminated maple neck with a two-way adjustable truss rod, 25.5 inch scale ebony fingerboard with Frailing scoop, and ‘dot and star’ inlay pattern. The eleven inch diameter pot uses a 3/8 inch maple rim and a Rickard-made, Dobson style tone ring. Tuners are by Gotoh and are quite good.